Summer is in fill swing. Sun’s out and it’s time for some vacation fun. An island vacation would be perfect. Perhaps Hawaii? 😉 If a Hawaiian vacation isn’t in the plans any time soon; have no fear because Island Flavor Cafe in Torrance is here to bring Hawaii to you. Island Flavor Cafe is a new a cafe offering us the most ono dishes ever. (Ono means delicious in Hawaiian). They have all the (Hawaiian) local favorites such as oxtail soup, spam and loco moco. Their breakfast grinds actually includes not one but three loco mocos (regular, roast pork and chicken katsu). They also have daily specials. Some specials in the past include pork lau lau, hamburger curry and sweet and sour spare ribs. On the day I visited their special was the Beef Curry Stew. The Beef Curry Stew is one tasty Hawaiian treat with tender beef, potatoes, carrots and lots of curry sauce. The curry sauce has a homemade feel and it goes perfect with the white rice. The main speciality of Island Flavor Cafe however is the Furikake Chicken. This dish is unlike any other and I was definitely both intrigued and delighted by it. In this past I have had many food dishes such as fries sprinkled with furikake; the dry Japanese seasoning that has sesame seeds and chopped seaweed. It is only here that I got to see it sprinkled over chicken. Their version of Furikake Chicken is delicious! The chicken itself is perfectly fried to perfection. The fried chicken is topped with a nice sweet glaze and sprinkles of furikake. It’s very flavorful and definitely ono. Hawaii maybe 2,479 miles away from Los Angeles but the taste of the islands is not. Island Flavor Cafe in Torrance will bring a bit of Hawaii to you along with some ono kine grindz 😉. For more smiles, please see my Yelp Review on Island Flavor Cafe. 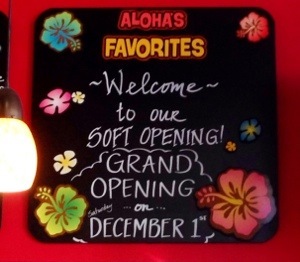 Hello Soft Opening of Aloha Pizza and Shave Ice Company! 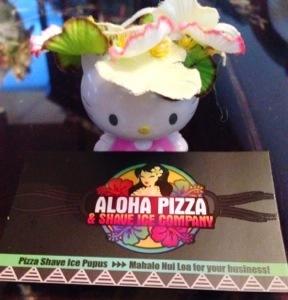 Today I said “Hello” errr…”Aloha” to a brand new place specializing in pizza and shave ice! 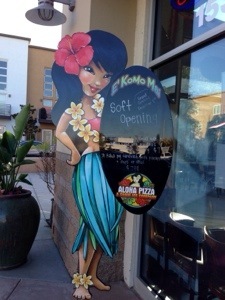 Aloha Pizza and Shave Ice Company is currently having their soft opening and I got to attend today! I’ve heard many good things about this place as well as seen many delicious looking photographs. My curiosity was peeked. 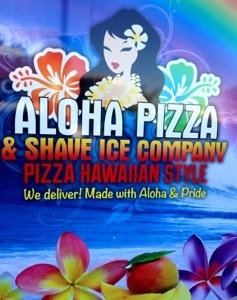 Aloha Pizza and Shave Ice Company has several different pizzas to choose from. I love all the various names for the various pizzas. They have Kamehameha (Da king) for their supreme pizza. They have Iolani (Our Princess) for the veggie pizza. They have Ikaika (Da Warrior) for the meat lovers . Da Pele (Goddess of Fire) for the spicy pizza. Their popular pizza however seems to be Uncle’s Kalua Pie! I chose to get that one. It has BBQ sauce, Kalua pork, red onion, fresh cilantro and mango. 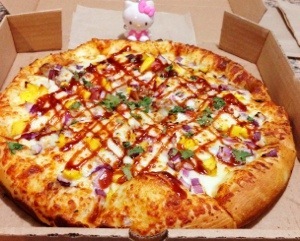 Whoever uncle is, hello kitty wants to be your favorite niece because this pizza was very nice! The Kalua pork which is homemade was sandwiched between the thick crust and cheese. There was plenty of BBQ sauce drizzled on top along with lots of fresh cilantro and my favorite, mangoes. No need to go to Hawaii because the whole pizza had a very nice touch of 808! Today Hello Kitty is Aloha Kitty. 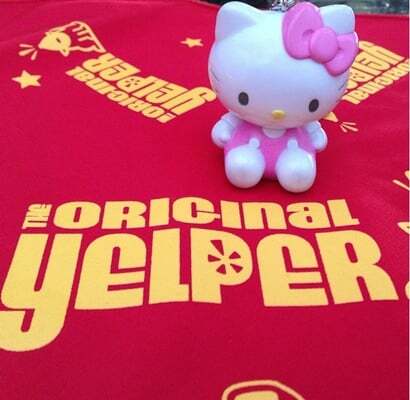 Hello Kitty Foodie says mahalo and looks forward to saying aloha again soon :). 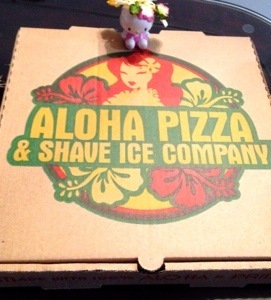 For more smiles, please read my recent Yelp review on Aloha Pizza and Shave Ice Company.